When it comes to golf, Sen. Saxby Chambliss has champagne taste. In California, the Georgia Republican has putted with his back to the thundering surf near the 7th hole at Pebble Beach, where a round of golf costs $495. In Florida, he’s driven the ball down the fairways of the Boca Raton Resort, with its signature island green on the 18th hole and its Waldorf Astoria interior. These are among the dozen premiere resorts where Chambliss played golf in 2007 and 2008 at a cost of a quarter of a million dollars. Yet Chambliss is hardly rich. His net worth is between $181,006 and $415,000, according to his 2007 financial disclosure report, ranking him 89th in the Senate in terms of wealth. Fortunately for Chambliss, a political fund covers the costs of his golf hobby. The fund received $692,618 during the 2008 election cycle, according to the Center for Responsive Politics. Almost all of it came from lobbyists, political action committees (PACs) and corporate leaders. The public might be forgiven for thinking the days are gone when lobbyists and special interests could pay for a lawmaker’s cross-country golf outings. After all, both the House and Senate in 2007 responded to a spate of scandals by banning members of Congress from accepting gifts of any value from lobbyists or the companies that hire them. But those reforms preserved a major loophole: leadership PACs like Chambliss’ Republican Majority Fund , which have far looser rules and get far less scrutiny than campaign committees. At first, only a few rising stars in Congress had them. Now, 70 percent of the members do. So do a dozen former members. In the past three election cycles, lobbyists and special interests poured $355 million into these funds, making them the second-largest source of political money for sitting members of Congress. Legally, lawmakers are free to spend the leadership PAC money pretty much as they wish. Search for your congressmember’s leadership PAC using ProPublica’s database. Lobbyists and lawmakers can — and do — use it to travel together to play golf at Pebble Beach, ride snowmobiles in Montana’s Big Sky Country and go deep-sea fishing in the Florida Keys. The lobbyists don’t pay the costs directly. They contribute to the leadership PAC, which then pays the lawmaker’s resort and travel bills. Leadership PACs have grown steadily since they began cropping up in the 1970s. What separates them from campaign committees is that lawmakers are supposed to pass along the bulk of the money to other members of their party for their campaigns. That way, lawmakers with leadership PACs can earn their beneficiaries’ support when it comes time to divvy up committee chairmanships and other party leadership posts. This system helps party leaders spread money to candidates with less money or tighter races. On the other hand, it also fuels the Washington money chase, allocates power in Congress based on fund-raising prowess and encourages lawmakers and lobbyists to mingle socially and recreationally as political money changes hands. Of the $112 million that leadership PACs spent during the two-year campaign cycle that led up to the 2008 elections, less than half was passed on to candidates or party committees, according to a ProPublica analysis of Federal Election Commission data compiled by the Center for Responsive Politics. The rest paid for entertainment, administrative costs, fund-raising and other categories that are so vague that it’s impossible to know for sure how the money was spent. “Some of the expenditures don’t seem related to elections and politics,” said Michael Malbin, executive director of the Campaign Finance Institute, a research center associated with George Washington University. Indeed, funds have been used for visits to Churchill Downs, Disney World and the Country Music Hall of Fame. They’ve paid for funerals, flowers and farewell parties. Rep. Charles Rangel, D-N.Y., used $64,500 from his PAC to commission a portrait of himself. All this is legal, even if it appears to make a mockery of the 2007 ethics reforms and the contribution limits at the very heart of the Federal Election Campaign Act of 1971. The Federal Election Commission (FEC), which enforces federal campaign finance laws, has no rule against politicians using the money for personal purposes. Senate ethics rules don’t even mention leadership PACs. The Senate interprets that silence to mean its ethics committee has no jurisdiction over leadership PACs whatsoever. The House, on the other hand, extends the same personal spending rules it applies to campaign committees to leadership PACs — but there are no known instances when the policy has been enforced. Meredith McGehee, policy director at the Campaign Legal Center, says leadership PACs should be abolished. Former FEC Commissioner Brad Smith, who generally opposes tighter campaign finance rules, nonetheless favors getting rid of leadership PACs. He says they give incumbents an unfair advantage because challengers typically can’t raise the maximum amount of money allowed for their campaign committees, much less for a leadership PAC. “For the most part it’s really kind of an incumbent racket,” said Smith, who’s now a professor at Capital University Law School in Columbus, Ohio. In March, the FEC’s six commissioners, three Democrats and three Republicans, sent Congress a list of legislative recommendations, including one to prohibit personal use of leadership PAC funds. Their letter went to House Speaker Nancy Pelosi and Vice President Joe Biden, in his capacity as president of the Senate. It also was sent to members of the House and Senate committees that oversee the FEC. So far, the FEC has gotten no response. ProPublica left messages at the offices of the speaker, majority leader and chairmen of the two committees seeking comment, but got no replies. “I am not hearing anything being done on the legislative front on leadership PACs,” said Craig Holman, the legislative representative of the consumer advocacy group Public Citizen. Party Building or Fun and Games? Democrats and Republicans alike use leadership PAC funds for play. Among Democrats, Senate Majority Leader Harry Reid of Nevada used his leadership PAC to entertain at Las Vegas casinos, including $32,985 at the Bellagio and $24,284 at Caesars. Sen. Charles Schumer of New York paid $32,760 to the New York Yankees and $14,490 to the New York Giants. Among Republicans, former Sen. Gordon Smith of Oregon, who was defeated last fall for re-election, spent $91,004 at the Bandon Dunes Golf Resort. Former Rep. Thomas Reynolds of New York spent $66,378 at Pebble Beach. The FEC disclosure forms that leadership PACs file are so cursory that lawmakers don’t have to disclose who participated or contributed at a PAC fundraiser, the day the event was held or how much money was raised. “The problem is that sometimes it’s hard to tell the personal from the political,” said FEC Commissioner Ellen Weintraub. Former North Carolina senator and Democratic presidential candidate John Edwards used his leadership PAC to pay videographer Rielle Hunter’s firm $114,000 in 2006 and 2007 to make a campaign video. Last year, he admitted he had an extra-marital affair with Hunter during that period. More recently, Sen. John Ensign, R-Nev., admitted to having an extra-marital affair with a woman who was on his leadership PAC payroll. Cynthia Hampton received $23,138 from the PAC during the 2008 election cycle. Only a quarter of the more than $750,000 that Chambliss’ PAC spent during the 2008 cycle — about $200,000 — went to help GOP candidates. The rest went for golf, including payments to resorts and transportation — a private jet on one occasion and limos on another. 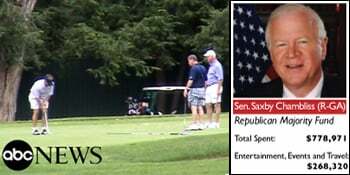 In July, ABC News cameras captured shots of Chambliss and other lawmakers golfing at the five-star Greenbrier resort in West Virginia. Chambliss declined to be interviewed for this story, but his communications director, Bronwyn Lance-Chester, said the golf outings were to raise money for his Republican Majority Fund. It is hard to determine whether some of the golf outings generated any donations. For instance, the leadership PAC made four payments totaling $10,372 to three luxury West Coast golf courses and links — Pebble Beach Resorts, the Inn at Spanish Bay and Pasatiempo Golf Club. Lance-Chester said the payments were for a single fund-raising event held Feb. 20, 2008. But no contributions were made to the leadership PAC that day. During the two-week period straddling the date, $15,000 came in, about average for a PAC that collected almost $700,000 during the election cycle but a low haul given that the period included a major fund-raising event. Lance-Chester declined to disclose who participated or made contributions in connection with any of the golf events. “All disbursements from the RMF account are reviewed and approved, and are made solely for RMF-related purposes,” Lance-Chester said in another e-mail. 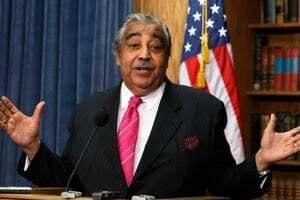 Fred Wertheimer, who has pushed to reduce the role of money in politics for more than three decades, said Chambliss could be running afoul of tax laws. Chambliss’ love of golf is so legendary in Washington political circles that he has been teased for letting golf interfere with his political and legislative business. Chambliss also took heat for skipping a sensitive closed-door Iraq war intelligence briefing in 2005 to golf with Tiger Woods. Defense lobbyist James Ervin, one of Chambliss’ longtime friends and contributors, defended the senator’s golf outings. Ervin’s wife, Teresa, is Chambliss’ deputy chief of staff. Ervin and two of his clients — defense contractors Lockheed Martin and General Dynamics — put $30,000 into Chambliss’ leadership PAC in the last election cycle. Ervin’s clients also made generous contributions to Chambliss’ campaign committee: Lockheed Martin $51,800 and General Dynamics $15,000. As the top Republican on the Armed Services Committee, Chambliss is well-positioned to help defense firms. He has been a leading proponent of the F-22 jet fighter, which is important to Lockheed Martin and the state of Georgia. When lawmakers leave Congress, they sometimes keep their leadership PACs or they hand them down like valuable heirlooms to their successors, with the same tight circle of lobbyists and lawmakers playing revolving roles. Former Sen. Don Nickles of Oklahoma controlled the Republican Majority Fund from 1985 until he retired in 2005. He then passed it along to Chambliss. Nickles now has a successful lobbying practice, Nickles Group, which along with its clients contributed $52,500 to the PAC during the 2008 campaign cycle. ProPublica contacted Nickles and more than a dozen other contributors to the fund. Ervin was the only one to return a call. In his case, he left a brief phone message but failed to return a subsequent call. First rate story with pictures to boot. Chambliss’ golf outings are just the tip of the iceberg. The PAC enterprise is a blight on the American political system. While I understand that lobbyists have enjoyed a long and checkered career in Washington I am still unclear to what purpose they serve. If they are strictly a condit for information, then why not simply increase the size of the staff for legislators and do away with the whole lot? However, in these tough economic times who would want to put a lobbyist on the unemployment roles? I would. Neal: I totally agree with you. This reporting by ProPublica is first-rate, and details an important (and incredibly unethical) sector of how Congress works. I too have no idea what point the lobbyists serve in Washington (besides smoozing with members of Congress), but whatever their purpose, they are obviously abusing the privilege of their access to power. I saw on ProPublica’s home page that this story was also run in FLYP (at http://www.flypmedia.com/issues/plus/21/#1/1), and they have some extended video interviews with the experts in D.C. that ProPublica relied upon for their reporting. They all seem to come to the same conclusion: leadership PACs are nothing more than slush funds, and Chambliss needs to stop going golfing.